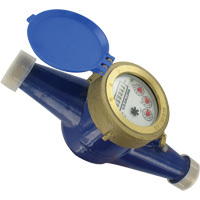 The SERIES WMT2 Multi-Jet Water Meter is a series of mechanical, water totalizing meters that display the total water usage in Gallons or m3 and provide a reed switch output proportional to flow rate. They are available in a range of body sizes and include NPT or BSPT couplings. Measuring chamber: Polyethylene, ABS plastic, ferrite, acetal. Transitional Flow: ±5%; Nominal Flow: ±2%. Pulse output with frequency proportional to flow rate. 0.1 gal, 1 gal, 10 gal, 100 gal per pulse (1 L, 10 L, 100 L per pulse). 0.01 A @ 24 VAC/DC. Color-coded lead wires, 4.5' (1.5 m) long. See dimension chart on catalog page.